I love organizing things! It acts as a cathartic cleaning of not only the space, but also my mind. 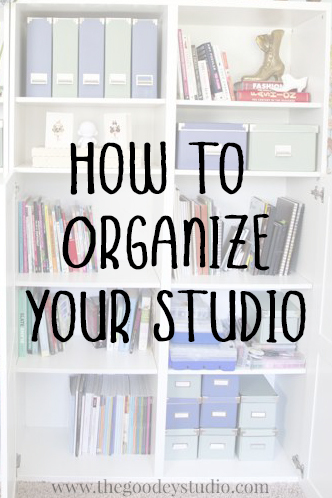 That’s why I’m sharing my tips for how to organize your studio. From art supplies to ideas everything needs organizing so we can function as the best artists we can possibly be. When you have an organized art studio you can find all the supplies you need at any given moment. You have fresh space to start new projects and a clear mind to dream them up. You will also create space to declutter your mind by keeping lists and calendars in places you can find them and use them. Organizing your studio creates mental and visual space to relax and let creativity take over rather than clutter. This step is critical for organizing. There is no shortage of baskets, bins or boxes in a variety of sizes to organize your art supplies with. I use a wide variety myself, but I group like items together and put them in a labeled container. This way when I know I want to work specifically with ink or watercolor I just go grab that container and bring it to my workspace. Then when I’m done working I can throw it all back in the container and put it back on my shelf which clears the workspace quickly and easily. Because lets be honest, if cleaning isn’t quick and easy, it doesn’t happen. The creative process can be a crazy explosion and I’m definitely not trying to tame that but I do think using a container system helps you find what you want in the midst of a project and easily clean up after. We want our eyes to focus on what we are creating, not the mess around us. 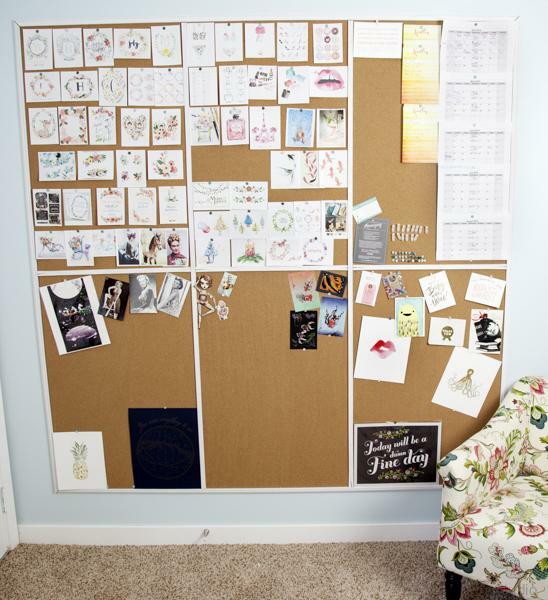 Like a blank canvas we need to organize your studio by creating visual blank space around us. How exactly you pull this off depends on the type of studio space you are in. I know this can range from a kitchen table to a dedicated room. Either way, you need to work on clearing the visual clutter in your space. I have a dedicated room in my house so I bought Ikea bookcases with doors. 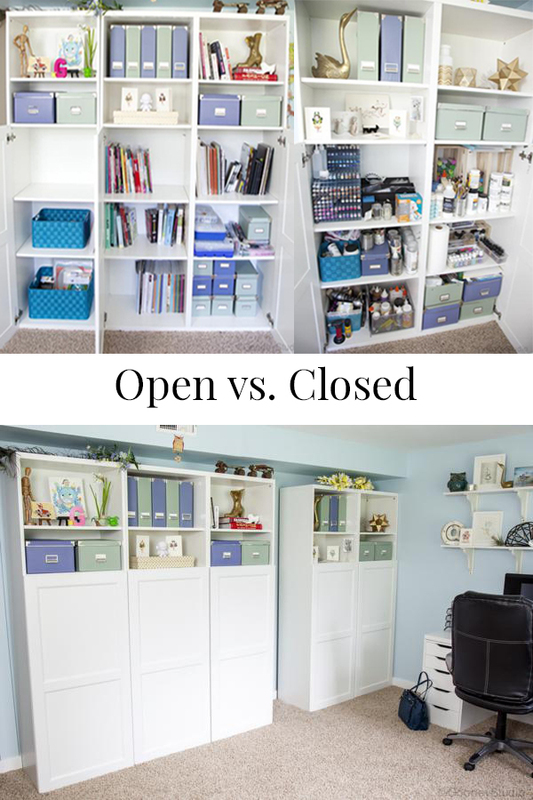 Look at the difference between the bookcases open and closed. The doors quickly and easily hide the visual clutter of all my studio supplies. It quiets the space and therefor my mind. In general I suggest finding ways to hide things behind doors whether it’s a closet or a buffet. In order to organize your studio for success you need to also organize your brain. We all have more thoughts in a day than we can keep track of. Writing ideas down and laying them out can help quiet our brains. Whether you are trying to keep track of deadlines or a multitude of ideas it is imperative to give your brain a break from having to remember it all at once, non stop. I’m a hands on visual person so physically writing things out and posting them up works best for me, but you can do similar things to all of this online in apps like notes, calendar and Pinterest. Ideas – I carry around notebooks or notepads with me where I will write down all the ideas that come to me. Then I’ll either post the whole page up or I’ll rewrite the ideas on sticky notes or pages based on idea themes. Basically, I like to write ideas down in ways that I can regroup them with like ideas or project based. I made a giant pin board where I could pin these ideas up including pictures. It turned out to be a life size Pinterest page. 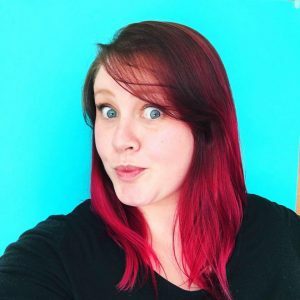 Deadlines – I print out several monthly calendar pages at a time and post them up so I can see deadlines I am working towards. In addition to big deadlines, I add start dates and expected progress check points so I know I am staying on track. Seeing a few months at a time helps me see where I can also block out rest days or weeks for that so called work life balance! 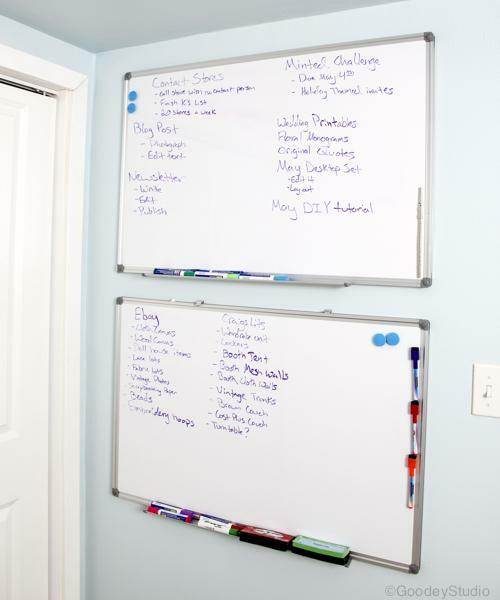 To Do Lists – I have a white board where I write out weekly and daily tasks for my husband and I so that we see things in bite sized chunks and can cross each step off. This helps us to not forget minor steps and also helps us see that we truly are accomplishing things on the to do list. I usually organize it by writing the project title and bullet point all the steps to finishing it so we can see where we are at with finishing the overall project. If you implement the ideas above in How to Organize Your Studio you will be able to let go of distraction and stress, which can be major roadblocks for the creative process. It may take some effort, a little bit of time, and a bit of money, but in the long run it will help your art process immensely. Do you have any other tips on how to organize your studio? Comment below to share with us.